On Monday, USD women’s basketball appeared on the AP Top 25 poll for the first time in school history. The Coyotes had recieved votes since Dec. 3rd, and in that time beat two top-25 teams in Iowa State and Missouri. Here’s what Athletic Director David Herbster on the historical moment, Coach Dawn Plitzuweit’s coaching style, and the Coyotes’ special season run. Austin Lammers: What was your first reaction when you heard the news? 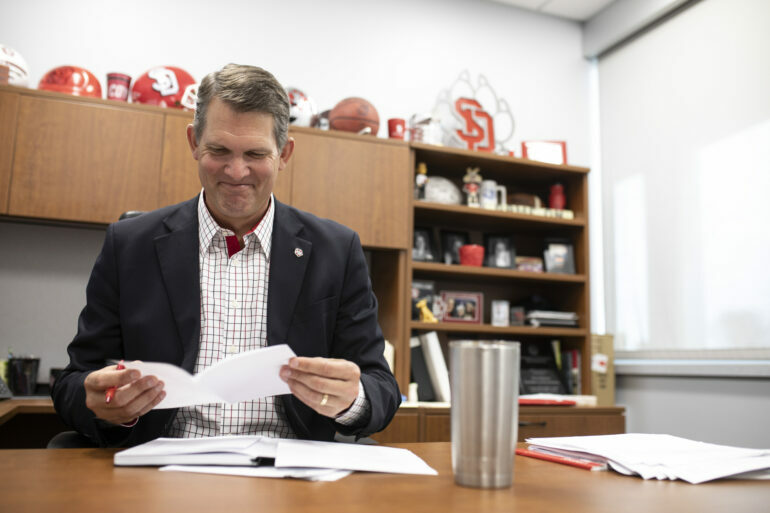 AL: What does this do for the entire athletic program at USD? DH: At various times, a lot of our teams have experienced great success— Chris Nilsen has won two national championships in the pole vault— you work to embrace and celebrate those things, because athletics is about wins and losses, and you’re gonna have your great wins and your sometimes devastating losses. What you quickly find in athletics is that you have another game to prepare for. I told Dawn today that being ranked in the top 25 is great, but it doesn’t mean anything other than a number before your name. You still gotta go back and go to work and prepare and keep everything in perspective. Just because you’re top-25 doesn’t mean you can walk onto any court and expect to win. If anything, that just makes the target on your back bigger. But I think it’s great recognition for our women’s basketball team, the university, the state of South Dakota and for the Summit League. Give this team enough time to prep for anybody, and they’re dangerous. AL: This is Dawn Plitzuweit’s third year, and it’s not always easy at every program to flip a team towards this success. What does that say about Coach P? DH: She’s an incredible person and an outstanding coach. As much as she’s trying to build a team, she’s teaching these young ladies how to be strong ladies for the rest of their lives. Sometimes, your team and your coaching can all come together, that the values that you’re instilling in them to be strong, empowered women in life also translate onto the court. You can have a coach that really instills those values, but the athletic success isn’t there; the athletic success is there, and you’re not necessarily on the other side. She’s really been able to incorporate the two frankly because she doesn’t let up on it. With Dawn, there are no off-days. She brings that energy to the table, that when you’re done talking to her, you feel good, you wanna play for her. That’s just her personality. She’s not putting on a front. That’s just who she is. And I think that makes her that much more endearing. She’s one of those that you wanna follow, that you wanna play for. You’re gonna get all the praise and you’re also gonna get ‘these are the things we need to do better’. She does it in a way that relates to real life. These ladies bought into each other and they trust each other. Certainly, at times, in games things don’t go as planned, but I don’t really see them get rattled. I don’t see that look in their eye that they don’t know what they’re doing. AL: In terms of your program, is this an expectation, a treat, or a treat that was expected? DH: Being ranked in the middle of the season is awfully good. We always talk about ‘it’s not how you start, it’s how you finish.’ We still have six or seven games left, we still have a Summit League basketball tournament left, and we don’t really want to lose sight of that. If we can finish the season ranked, that’s a special accomplishment; only 25 teams out of 350 get that opportunity. This is recognition for the hard work that we’ve done up to this point. But you can lose it a lot faster than you get it. I’m proud. I’m excited. It’s a pretty special moment. To come at a week when you have the inauguration of a new president, it’s a fun, upbeat, vibrant time right now.